Fortunately we have a doorway we don't ever use which turned out to fit three of those super minimal Delta Leonardo Single-Bike Racks side by side! As for the assembly... using a 1.5" thick board which spanned the entire door frame, I screwed each hook 15" apart (center-to-center) which is the closest you'll likely get away with -- though partly depends on your handle bar style/width. Once the hooks were in place on the board, I pre-drilled the holes into the board, and used 4" long screws to anchor it into the wood framing of the door. Drilling directly into the wood door framing created a super secure attachment. 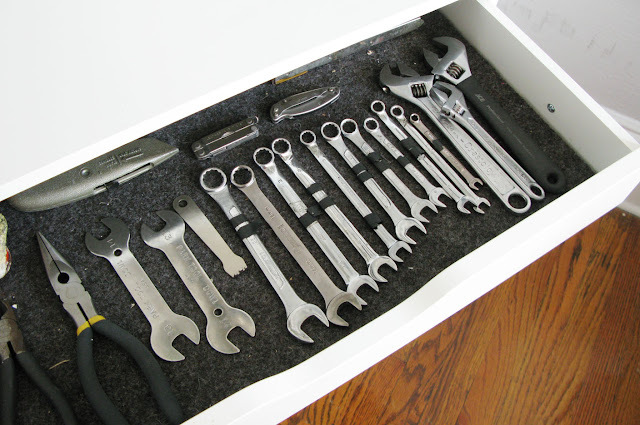 And to deal with the all the bike tools which were previously spread amongst two different toolboxes and under the sink storage bins -- I was able to consolidate almost everything into one of IKEA's "ALEX" drawer unit! 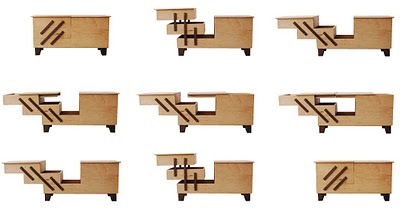 It has six shallow drawers and comes with casters so you can easily wheel over your tools to wherever you please. 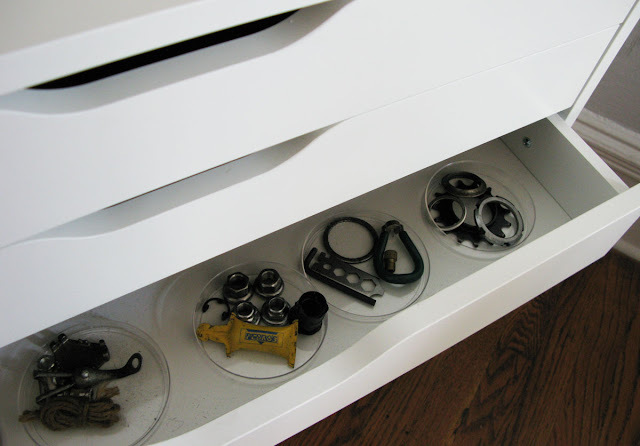 Little enhancements I made included lining some of the drawers with industrial felt padding to help keep them in place and used some old petri dishes to keeps tiny parts organized. One thing I'm considering doing is reinforcing some of the drawer bottoms which are holding lots of tools since they began to bow a bit. Spending the $161 ($14 (x 3) on hooks + $119 on drawers) was well worth it for space saving benefits!!! 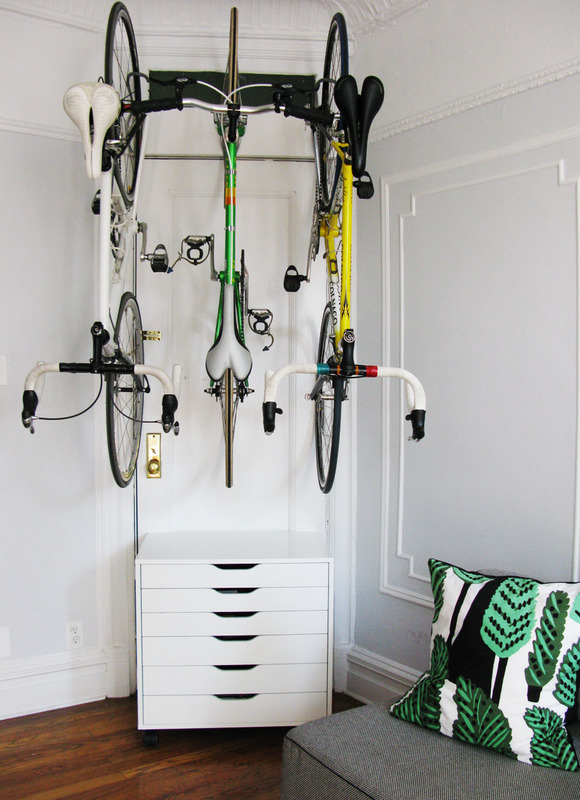 If you've come up with a crafty indoor bike storage option - do share! For those of you who know me well, I know what your thinking... what happened to the Bike Utility Bench you designed? What can I say, there is really that much stuff to store at home -- and use the bench for larger items like extra helmets, gloves, accessories! Here's my cheap/DIY solution. This is situated in an under-used corner right beside the door to our apartment. Nice solution + use of screwdrivers! For bikes with large racks I agree that it is saver to have the weight remaining on the floor. These are hung closely together so I go about removing/hanging the bikes carefully. They are also hung pretty high... but these are our lightest frames and you also end up gaining all that space underneath! The bottom of the rack/hook measure at 7' from the floor (which makes the top wheel height at 8' hanging up). I end up holding the bike frame with one hand and the bottom of the wheel being hung with the other so they line up. It is doable - though much easier if your taller then me (I'm 5'4")! That is a sweet setup. 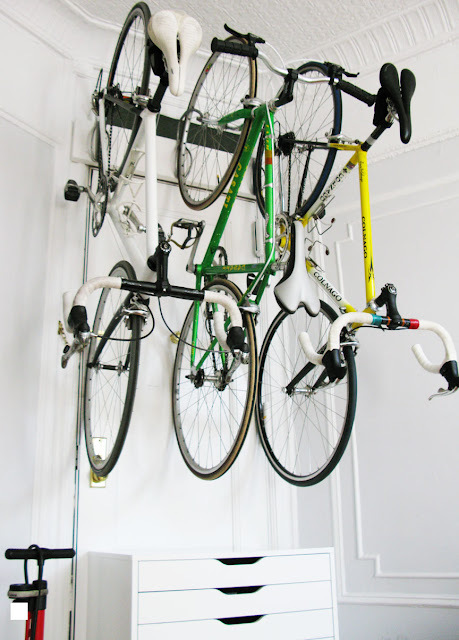 We used to have a similar closet hanging system (sorry--no photos...) that managed to hold 4 pairs of wheels. Yay for high ceilings. 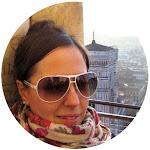 I appreciate your article just about this good topic.Thanks for sharing. Wow, this is amazing, you really thought this out, fantastic! I'm extremely short on space and recently found a place that has dedicated interior bike storage in Prospect Park, parkcirclestorage.com. It solved my problem, since I can't replicate what you did, but my next place will have something similar if I had taller ceilings. Nicely done!